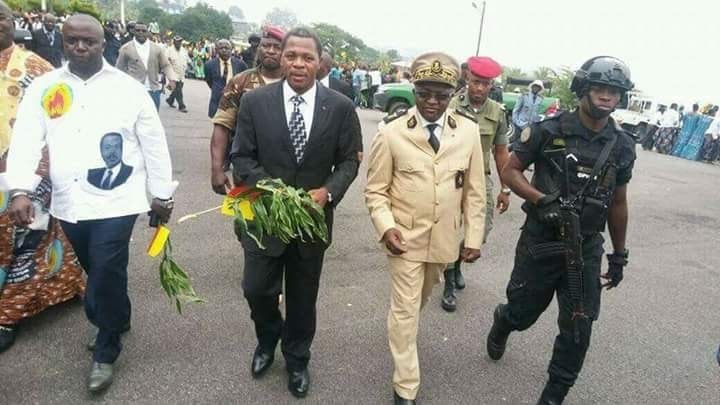 BaretaNews has received a VERY URGENT CONFIDENTIAL memo from the Presidency of French Cameroun requesting the colonial Minister of Territorial Administration, Paul Atanga Nji to ensure that run-away colonial administrators in Ambazonia be reinstalled in their various jurisdictions latest September 10, 2018 though nothing seems to have happened as of now. Today, in Bafut, Restoration Forces were fighting occupied forces as they tried to reinstall a DO in Bafut. The very urgent and confidential memo which is titled “Reinstallation of administrative authorities in Subdivisions in the North West and South West” is dated September 7, 2018 and signed by the colonial Secretary General at the Presidency of the Republic, Ngoh Ngoh Fedinand. According to Ngoh Ngoh, the decision to reinstate these colonial agents has been taken following very high instruction from the colonial President Paul Biya. The slave boy Atanga Nji is also requested by the memo to concert and work with Colonial terrorist outfits notably the National Gendarmerie, National Security (Police) and other defense agencies to ensure that these colonial administrative officers who ran away from their functions due to Fear of Ambazonia Restoration forces are reinstalled into their functions; in addition to looking at the necessary constructions that are required for the colonialists to do their job especially in those areas where their offices have been completely destroyed..
For the northern zone of Ambazonia, the affected Counties include Mechum, with six (6) abdicated colonial administrators and Momo County with two abdicated colonial agents. In the Southern Zone, the affected Counties are Meme, with one (1) escapee colonial agent which is the Colonial D.O for Konye, Lebialem County with three (3) escapees’ colonialists, Kupe Manenguba with one run-away D.O and Ndian County with two (2) run-away colonial administrators. From the colonial memo, the re-installation is supposed to have taken place latest two days ago (September 10, 2018). However, it is not clear if the illegal instructions have been implemented. The colonial regime wants to reassert itself in areas where restoration forces have made ungovernable but this must not be allowed to happen. Colonial agents must be chased away for good. If they think the people of Ambazonia are joking in the Restoration of the Independence of Southern Cameroons Ambazonia, then they are seriously mistaken. The revolution can never be truncated. Let the colonial administrators continue to listen to that their demi-god that they worship in LRC. However, they should understand that as persona-non-grata, their attempt to undermine the will of the Ambazonian people will be met with fire.